I am lucky enough to have a job that brings me back to Beirut every few weeks. Every time I come home there are certain dishes I absolutely have to have. 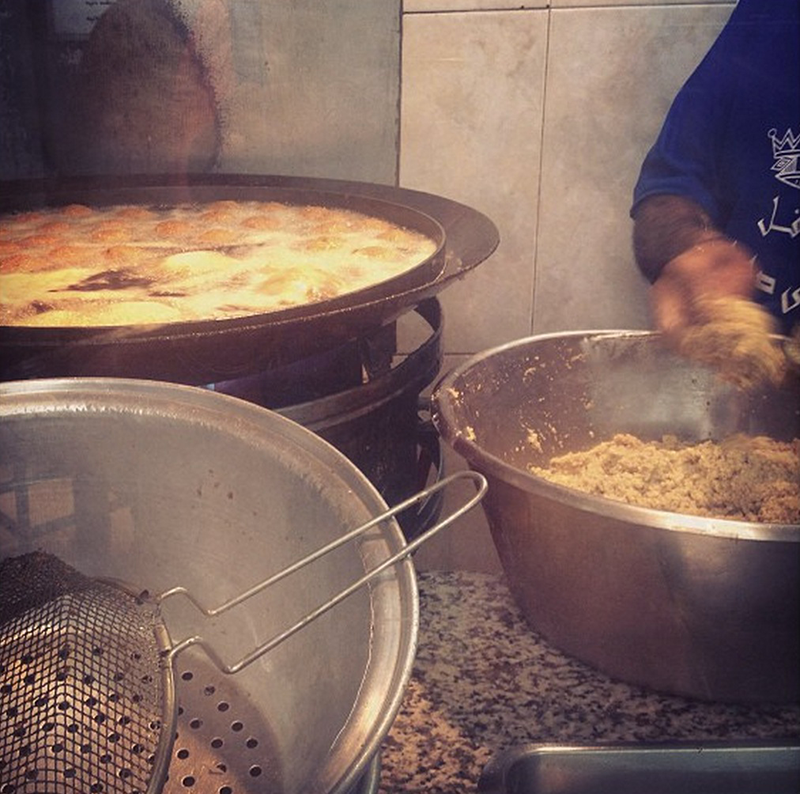 On the long list feature my mother’s Kibbeh, dinner at Mayrig, and Falafel at Sahyoun, the original one, but more on that later. Though the origins of Falafel are disputed, some speculate that they go all the way back to Pharaonic Egypt. A more accepted theory is that they were eaten by Copts during lent, as replacement for meat. While the dish was originally made of fava beans, as it traveled to the Levant, the beans were replaced with chickpeas. The chickpeas are soaked overnight then ground together with other ingredients like parsley, onions, or garlic, as well as a mixture of spices for seasoning, and some flour, then rolled into balls and deep fried. In Arabic, there is a saying that roughly translates into: “Falafel is the breakfast of kings, the poor man’s lunch, and the fool’s dinner.” The deep fried balls of beans may be hard to digest, but they are loved unanimously, across imaginary borders, social classes, and ages. Hang out in a Falafel joint in one of the streets of Beirut long enough, and you will see all sorts of people come into the shop. Workers, families, foreigners, old and young, on foot, in their cars, or a on a motorbike. 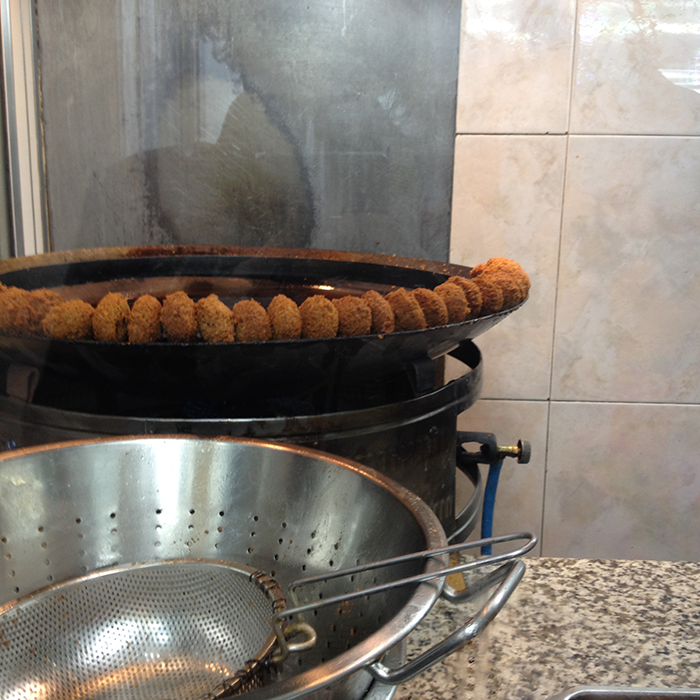 In fact it is interesting to note that, even though most other street foods, like man’oucheh or Kaak, have been re-interpreted as more high end versions, falafel remains a very democratic food, available mostly in popular food stalls . Some prefer to eat the fried balls solo, but I am an adept of the Falafel sandwich. 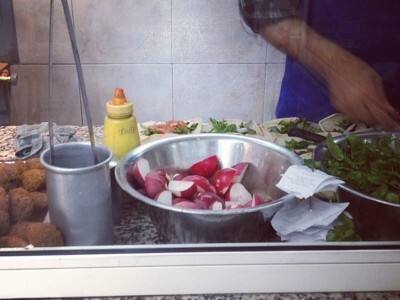 The cook places one side of a pita bread on a flat surface, they lay out a bed of fresh parsley and mint, onto which they lightly smash three or four of the hot falafel balls, before cutting up slices of tomatoes and radish at the speed of lightning, which they then drizzle with Tahini sauce. If you have lived in Beirut long enough, then you must have witnessed a few heated debates about where to have the best Falafel. 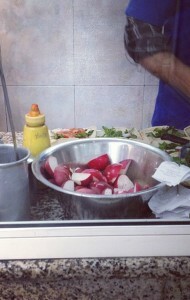 If you ask me, all the falafel shops of this world are in one category, and the original Sahyoun in another. 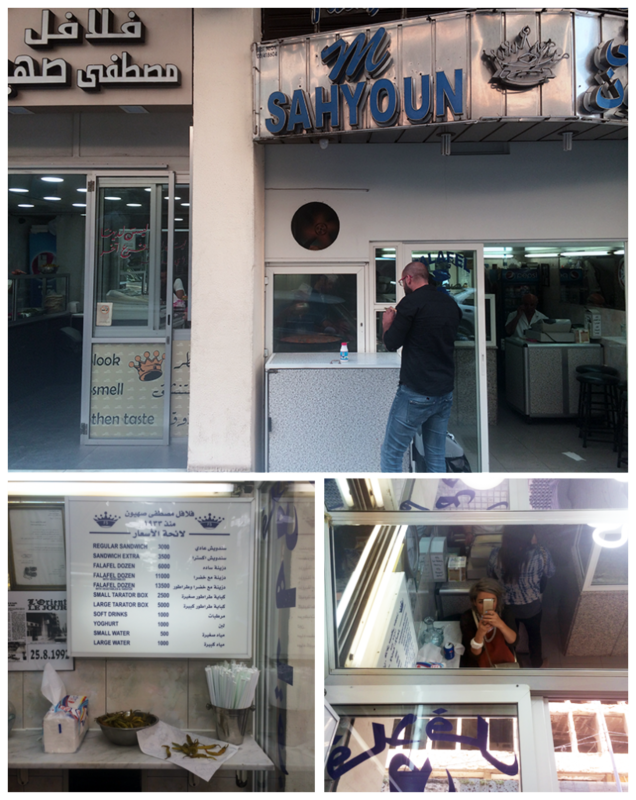 Sahyoun, which opened in 1933, is located on Damascus road, just outside of Downtown Beirut, on what once was the demarcation line. Ask anyone on the street and they will be able to point you to it. But beware! There are actually 2 Sahyouns sitting side by side on Damascus road. The original one, the one to the right, with the blue sign that says M. Sahyoun, is tended to by Zouheir, Mustapha Sahyoun’s first son. The one to the left was set up in 2006 by Zouheir’s younger brother, Fouad. As of yet, no one really knows what caused the family feud that resulted in this strange situation. Both shops look strangely similar, with a crown on their sign, a clean marble counter, a register, and a couple of places at a bar. My parents, and by extension myself, have always been patrons of the original shop. If you ask me, nothing beats ordering your sandwich at the register, and peeking through the glass separation as its being prepared, then standing by the tiny marble bar, with your sandwich in one hand, a can of Pepsi in another, snatching the occasional pickled pepper from the generous bowl that is on the counter. 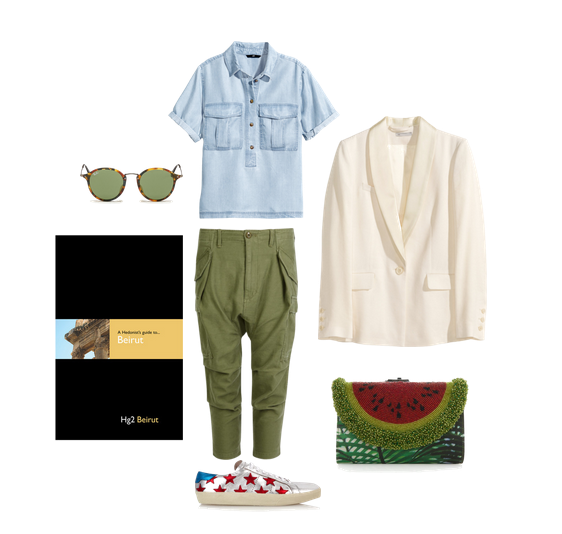 Head over to the blog for this and more Fashion inspiration. This post was originally published as part of an ongoing collaboration with Bucolik.com, exploring cities through food, culture and fashion. Bucolik is a carefully curated blog and design-centric online shop that unearths a daily pallet of fresh, rad, one-of-a-kind designers from around the world. 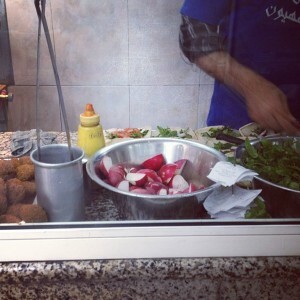 As the saying goes, it’s probably best to visit Falafel Sahyoun for lunch. In fact they close relatively early in the evenings (around 9PM). I also believe they are closed Sundays. Great article and rich history.